The Indian government machinery at local levels, with direct or tacit support of central government, is systematically escalating its attacks on working class and peasant communities across India. A series of working class struggles in the National Capital Region has been suppressed through the deliberate use of state law and order agencies leading to abuse, physical violence, kidnapping, and murder. The working class struggles in the NCR have been organised by formal and informal sector workers, local and migrant workers, and regular and contract workers. They have been led by local people as well as by migrant workers who have been displaced by anti-people exploitative development in Bihar, Jharkhand, Eastern UP, West Bengal, Orissa and other exploited states. The seminar will focus on the struggles in the NCR – in companies and factories such as in Viva Global, Rico, Honda, Maruti, Musashi, Graziano – in the context of a growing governmental orchestration that seeks to suppress dissent and fundamental rights of the majority of Indians across the country in order to line the pockets of a small minority, under the guise of ‘development’. Participants in the seminar will include national trade unions, human rights organisations, people’s movement organisations, researchers and scholars, and other interested individuals and organisations. Garment & Allied Workers Union, Plot No. 48, 1st Floor, Opposite Maruti Gate No. 2, Old Delhi-Gurgaon Road, Gurgaon, Haryana). LUNCH TIME VIGIL BY WORKERS OF VIVA GLOBAL. The day and night sit in of the workers of the Viva Global Factory (Gurgaon) entered its 20th day today. They have been sitting at the gate of the Factory since the 25th of August 2010, in protest against the mangement's decision to illegally lock the workers out of their work place. These workers today reached 'Continental Carriers' a well known logistics Company based in Mahipalpur also owned by Mr. Vipin Vohra. Since all attempts have failed to get Mr Vipin Vohra, the owner of Viva Global to the negotiation table, the workers are trying to reach him in his different offices and residences, in an attempt to convey to him that hiding is no answer to resolve workers issues and problems. Interestingly, the Labour Department, whose job is to enforce labour laws at the Viva Global Factory, has been unable to get Mr. Vohra to come for signing an agreement with the workers. Even Marks and Spencer, prominent buyer of apparel from Viva Global has been unable to get Mr. Vipin Vohra to come and talk to workers to discuss issues. Marks and Spencer has announced that it will no longer source from Viva Global. Even this has not budged Mr Vohra from his arrogant stance. Today, the workers highlighted the fact that their families have begun to face food shortages, thanks to being not allowed to work at their factory, as they have been illegally locked out of their work place by Mr. Vohra's Management. During the peaceful vigil, the workers of Viva Global interacted with some of the workers of Continental Carriers, who told them that the situation in Continental Carriers is similar, vis a vis implementation of Labour Laws. In fact, the workers of Continental Carriers too have organised themselves and are engaging with their management which is also turning a blind eye to their legitimate and fully legal demands. Mr. Vohra has been making headline news for labour law and other violations not only in India, but also abroad. The actions of the Management of Viva Global have brought serious disrepute to India. Workers of Viva Global have been demanding that labour laws be implemented in the Factory, to which Mr. Vohra and his management has been turning a blind eye and a deaf ear. Mr. Vohra has been using goondas against workers who are thus forced to be constantly working in a terror ridden environment. He does this, so that workers in his factory do not demand what is legally due to them. PRESS INVITATION for LUNCH TIME VIGIL. to Marks and Spencers, UK. N.H. 8, New Delhi – 110037. 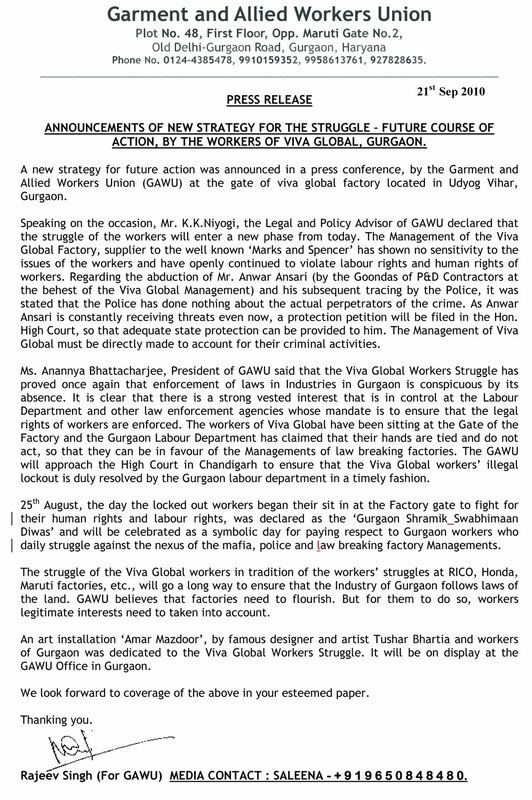 The Viva Global Workers of Garment & Allied Workers Union are escalating the struggle for justice against the illegal and criminal activities of M/S Viva Global and its owner, Mr. Vipin Vohra. It is clear now that Mr. Vohra has been mis-leading the workers into thinking he will respect labour department proceedings. GAWU is launching an intense campaign to send a message that businessmen like Mr. Vohra who indulge in criminal and illegal activities will not be tolerated. On September 9, at the mutually agreed meeting called by the Labour Department, Mr. Vohra sent representatives who stated clearly that they had been given no mandate to negotiate. GAWU President, Anannya Bhattacharjee, Legal Advisor, K. K. Niyogi, Viva Global leaders Narender Singh, Sangeeta, and Pradeep attended the meeting with hopes of an amicable settlement but were thoroughly disillusioned. The Labour Officer in Gurgaon has issued a failure report for conciliation. In the evening, GAWU leaders and workers held a candle-light vigil at one of the mansions of the proprietor of Viva Global, Mr. Vipin Vohra – 59 Poorvi Marg, Vasant Vihar, New Delhi. The workers informed passers by about the beating of workers, the kidnapping and attempted murder of worker leader Anwar Ansari, and criminal conspiracy to deny freedom of speech as practiced by the Viva Global management. The workers are determined to continue the protest at the factory gate of Viva Global, (located at Plot No. 413, Phase III, Udyog Vihar, Gurgaon) to send a clear message to the industry and the government that anti-social business practices have no place in Gurgaon and must be punished and stopped immediately. We would request you to cover the workers’ candlight vigil at the Viva Global owner’s residence and the disregard with which Viva Global has approached the workers’ efforts to come to a peaceful and amicable settlement, and publish the news of the above, in your esteemed newspaper. With thanks // Rajeev Singh. For the Mazdoor Ekta Manch, Gurgaon. The hunger strike of Ms. Anannya Bhattacharya (President of the Garment and Allied Workers Union) ended today, after Anwar Ansari, the abducted worker of Viva Global was released by the goons of the Management of the Viva Global Factory, Gurgaon. He was released late last night, and had a harrowing time during the period of his illegal confinement. Addressing a Press Conference this afternoon at the Gate of the Viva global factory, Ansari said that he was beaten badly by the hired goons of the Viva Global Factory and its Contract labour supplier, PND Contractors. He was beaten along with other workers yesterday morning when they came to work at the Factory. Their only 'crime' was that they were supporting the cause of the illegally terminated contract workers at the Factory. After being kicked and then brutally beaten with sticks, he was bundled into a vehicle and taken to an unknown destination. He was initially kept in a moving vehicle with eyes blindfolded and later confined to a room in an undisclosed destination. He was ordered to leave for his home state, and repeatedly threatened with dire consequences, in case he dared to return to Gurgaon or Delhi. He was dumped near his home at night from where he managed to reach home. Ansari came back bruised badly with a black eye and swollen forehead along with multiple blunt object injuries inflicted upon other parts of his body. It is obvious that the Management of the Viva Global have decided to use violence against workers to browbeat them to agree with their illegal and unfair labour practices. Today The Garment and Allied Workers Union have demanded that those persons responsible for abducting and assaulting Ansari be arrested immediately. A 24 hour ultimatum has been given to the Gurgaon Police to bring the criminals to book. In case they fail to do so, the workers dharna at the gate of the Viva Global Factory will continue and more workers from other factories as well will join the workers of the Viva Global Factory in their struggle. The workers have also demanded that the illegally terminated contact workers be taken back by the management of the Viva – Global, in accordance with the Tripartite Agreement between the Labour Department, Viva – Global Management and the garment and Allied Workers Union, that was signed on the 23rd of August 2010. We would request you to cover the Hunger strike and publish the news of the above, in your esteemed newspaper. 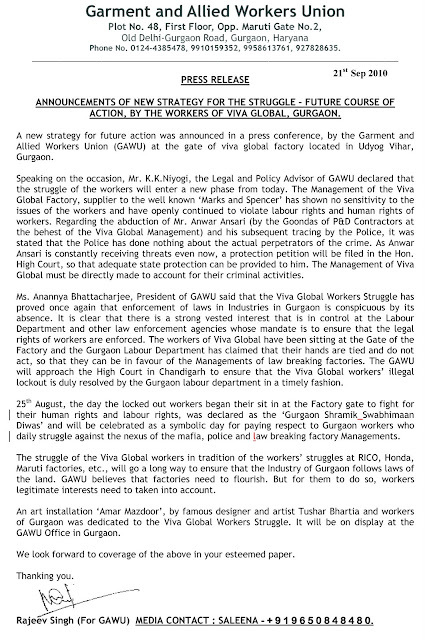 VIVA – GLOBAL (GURGAON) WORKERS BEATEN UP- HUNGER STRIKE BEGINS TODAY. Workers including of the Viva Global Factory, including women were brutally beaten up with hockey sticks and lathis by goons called in by the Management of Viva Global, the Gurgaon based sweatshop apparel house. The incident happened this morning between 9:30 and 10:00 AM when workers were to enter the premises of the Factory, as part of a tripartite agreement between the Management of Viva Global, the Labour Department and the Garment and Allied Workers Union (GAWU). The agreement was the outcome of a meeting between the three parties, held on the 23rd of August 2010. The prevention of workers entering the factory, is a serious violation of the above agreement. Besides being beaten, a few workers were abducted in a vehicle by the goondas and taken to an undisclosed destination. At least one worker is still missing. 1) The abducted workers be immediately brought back. 3) The Management of the Viva Global apologise to the workers. Representatives of the Mazdoor Ekta Manch have also lodged a police complaint against the management for the unprovoked violence on workers and the abduction of workers. Viva Global is a major supplier of apparel to 'reputed' multinational superbrands such as Marks and Spencer. There have been serious violations of labour laws and human rights at the Viva Global Factory. The Management has been using strong arm tactics against union leaders, representatives of workers etc., each time that the workers have demanded that basic amenities and legal wages be given to them. On the 21st of Aug 2010, at 6.00 PM, contract workers were locked out of the Factory in an attempt to illegally terminate them. Other workers (non-contract workers) had then demanded that contract workers be given their rights in terms of notice pay and the PF amount that has already been deducted from their wages. Even on 23rd of August, when workers reported at the gate for duty, they were allowed to to enter the factory. About 15 local goons with pistols had threatened the Union leaders and workers. A group of workers and union activists had then complained about the incident to the Labour Department which led to the tripartite agreement which had resolved : 1) That there would be no goondagiri by the Viva Global Mangement whatsoever, 2) All workers who were locked out would be taken back. Another tripartite meeting is also scheduled for Thursday the 26th of August for further discussions. However, the Management of the Viva Global has already violated the agreement of the 23rd of August. We would request you to cover the Hunger strike and publish the news of the above incident, in your esteemed newspaper. Media Contact: P. Saleena : 9 6 5 0 8 4 8 4 8 0 . Viva Global, the Gurgaon based supplier of apparel to 'reputed' multinational superbrands such as Marks and Spencer is once again making news for wrong reasons. After getting International and National level recognition as a 'sweatshop' Asian supplier, its management is now busy trying its best to silence the workers who have been demanding that contract labour in the Factory be not illegally terminated. While use of threat and violence against workers at Viva Global by its Management is not new, things took an ugly turn Today, with Police and local goondas being brought in by the Management to threaten the workers. The goons brandished guns openly till the time that the Police came in at 10.00 AM on the request of the Viva Global's Management. This episode began on the 21st of Aug 2010, at 6.00 PM, when 28 contract workers were stopped at the gate of the Factory by a supervisor of the Contractor of the Factory and their security guard. The guard and the contractor's supervisor also refused to let the workers sign the attendance register. They were further told that they will be terminated on Monday the 23rd of August 2010. Other workers (non-contract workers) demanded that contract workers to be given their rights in terms of notice pay and the PF amount that has already been deducted from their wages. However, today at 9.30 AM, when workers reported at the gate for duty, no contract workers were allowed to to enter the factory. In order to stop them from entering the factory, there were around 15 local goons with pistols to threaten workers. Along with contract workers, union leaders were also stopped at the gate and threatened by these thugs. "If you value your life, keep quiet. Or else we will shoot all of you. You can go anywhere with the complain, to Labour office, or Police or anywhere; we are not bothered." They were told. When other workers who were inside the factory wanted to come out to express their solidarity, they were stopped and threatened by these thugs. Women workers were threatened " If you dont keep quiet, you will be beaten up badly"
A group of workers and union activists have complained about the incident to the Labour Department. We would request you to publish the news of the above incident, in your esteemed newspaper. PRESS RELEASE, Dated: 16th August 2010. PROTEST AGAINST MARKS AND SPENCER IN DELHI, BY MAZDOOR EKTA MANCH. ‘We are not even paid the legal wages that are due to us’ says Rajesh Kumar (name changed), one of the workers of the Viva Global factory, Gurgaon. He along with other workers had converged at the DLF Mall – New Delhi to participate in a peaceful protest against Marks and Spencer, an international brand from the UK, who uses Viva Global as a prominent source for globally supplying apparel. Today afternoon’s demonstration was organised to support the workers at Viva Global, Gurgaon, at the M & S outlet in the Mall, situated in Saket in New Delhi. M & S has constantly maintained that it sources only from those producers who follow all labour laws and treat their workers in accordance with the various laws put in place to ensure that their rights are not violated. However, this claim of M & S has been beaten hollow, by the string of violations of all kinds of labour laws at the Viva Global factory in Gurgaon where workers are denied even mandatory basic amenities such as drinking water and sanitation, besides the absolute disregard to basic safety norms; resulting a few days back into a tragic incident when a woman worker had gone to the toilet and used a clear liquid for washing, mistaking it for water. She was hospitalised with severe acid burns. The management verbally and physically abuse workers who speak against the illegalities in the factory, viz., practice of forced labour, making workers work without drinking water and air coolers, etc. To protest against these violations, the Viva Global workers have been engaging in a struggle since April 2010. Women workers have been an active part of this struggle. The management has responded by calling the police to threaten the workers, by engaging goondas to intimidate them. This amounts to serious violations of human rights. M & S has been apprised of the situation on many occasions both in India and at international levels. However, they have resisted making meaningful changes in Viva Global factory. As a buyer company, M&S is certainly responsible for ensuring that laws are respected by its supplier companies. “We believe that such exposure of exploitation by media should not lead to termination of sourcing by buyers such as M & S. In fact, we urge buyers to ensure labour rights in their supplier companies and commit to continue sourcing”, says Shena Gamat, a Delhi-based theatre artist and a supporter of the workers. Today’s protest evoked keen response from the shoppers who were entering the premises of M & S. To their surprise they were greeted by a long banner at the entrance to the store crying “Shame! Marks & Spencer. On reading a pamphlet handed out by protestors, many shoppers were aghast at the fact that they were unknowingly buying goods made by highly exploitative processes. They readily signed letters of support that voice their concerns to the Management of the M & S and Viva Global . More pictures can be provided on request. The Mazdoor Ekta Manch, Gurgaon has organised a peaceful protest demonstration at the Marks and Spencers outlet at DLF Mall, Saket on the 16th of August 2010, at 1:00 PM. We will be assembling at the ENTRY OF THE DLF MALL, Saket at 12:50 PM. Marks and Spencers sources its apparel from Viva Global, a factory based in Gurgaon, which is a prominent supplier, out of its various sweatshop suppliers. Viva Global has been indulging in serious exploitation of labour rights and Marks and Spencers has been continuously turning a blind eye to these violations. For this, it has gained National and International media publicity – as a multinational corporate house, that is insensitive to the rights of workers. There has been continuous pressure in India and Internationally on Marks and Spencers to take the above violations seriously and ensure that labour rights are adhered to, by their suppliers. We are not calling for the termination of its sourcing by M & S. In fact, we are urging it to follow its own claimed high standards and practices to ensure labour rights in supplier companies (such as Viva Global) are met, and commit to continue sourcing. The Mazdoor Ekta Manch is a platform of workers and their organisations. It has been working on the issue of rights of workers, especially in the garment and allied sectors. We work for implementation of labour rights and labour organising, in the new, extremely exploitative industries in Delhi and Haryana. We have been continuously taking up the issues of the exploitation of workers of Viva Global, at various levels. MEM has been pressurising companies such as Viva Global to follow labour laws and provide the necessary appropriate working conditions to their workers. However, these companies have been evading their responsibility towards their workers and have used every possible means to scuttle efforts by workers and their representatives who have been fighting for their legal and human rights. I would request you to cover this important event.